What is Active Safety System in the car? Active Safety includes set of safety features which reduce the chances of an accident or collision in the first place. Some manufacturers also call it as the ‘Primary Safety System’. Manufacturers employ the active safety systems mainly to avoid the accident. These systems activate before the accident takes place so that they could possibly avoid the accident. The engineers/vehicle designers build a car with a high level of active safety through superior design. This includes characteristics such as road holding, visibility, comfort, handling, and ergonomics. Therefore, the safety system such as the Anti-lock Braking System or ABS belongs to the active safety. However, the airbags, seatbelts, and others safety features come into play during an accident. Hence, they are called the passive safety systems. Active systems respond to an abnormal event such as a safety problem. These systems can be activated manually by the driver or automatically by a computer-driven system (by an ECU). Or sometimes, they are part of the mechanical design itself. Furthermore, such technologies could help avoid collisions and mitigation. Hence, they will play a key role in automobiles in future. Vehicle component manufacturers such as Bosch, Delphi and ZF are some of the leading companies which supply such safety systems. What is Passive Safety System in the car? In contrast, the passive safety systems are those systems which react to the abnormal event. It means that these systems activate during or after the accident takes place. Thus, the passive safety systems help to reduce or decrease the effect of the abnormal event like an accident. 1.Passenger safety cell – Many manufacturers make the passenger cells safer by adopting new technologies. For e.g., Suzuki uses the term ‘TECT’ which stands for ‘Total Effective Control Technology’ in making its Vitara Brezza body structure. Hyundai uses the term ‘Hive’ which denotes the strong body, stability, and sturdiness of Hyundai Creta. 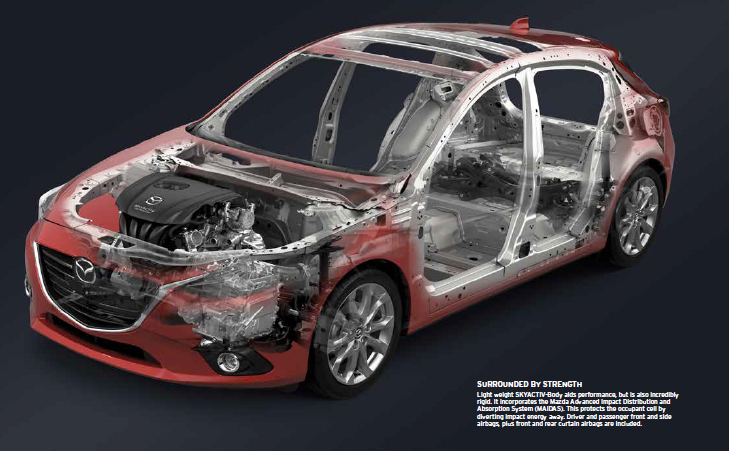 Mazda uses the term ‘SKYACTIV’ for its body which boasts lightness and rigidity. 2.Crumple zones –Most car manufacturers include crumple zones which are effective in reducing the impact of the collision while designing their body structure. 4.Correct positioning of fuel tanks – The fuel tanks positioned correctly reduce the chance of getting damaged during the rear-end collisions. For more information on US safety regulations, please click here. Home » Technical Anatomy » Active Safety System Vs Passive Safety System – What is the difference? What is Compression Ratio in Petrol and Diesel Engines? What is Rear Engine Layout And Know How Is It Beneficial?